As Kyrgyz President Kurmanbek Bakiyev is seeking re-election in July, he is balancing foreign policy between promises made to Russia and maintaining relations with the United States. Any decision on foreign policy is made with the idea of retaining his power, despite his low approval rating within the country. Thus far, Bakiyev has successfully balanced Bishkek's cooperation with both Russia and the United States. In February, Bakiyev announced his decision to expel the U.S. from the airbase in Bishkek by August 18, after Moscow promised over $2 billion in loans. Since then the Kyrgyz government has denied that any official negotiations are taking place either with the U.S. or Russian governments over the status of the Manas base. Official information on the Manas base has remained scarce, providing fertile ground for rumours. Omurbek Tekebayev, a prominent opposition leader, claims that both sides have reached a tentative agreement to retain the base in Kyrgyzstan for at least another three years (www.akipress.kg, May 13). The airbase has been crucial for U.S. and NATO military operations in Afghanistan. 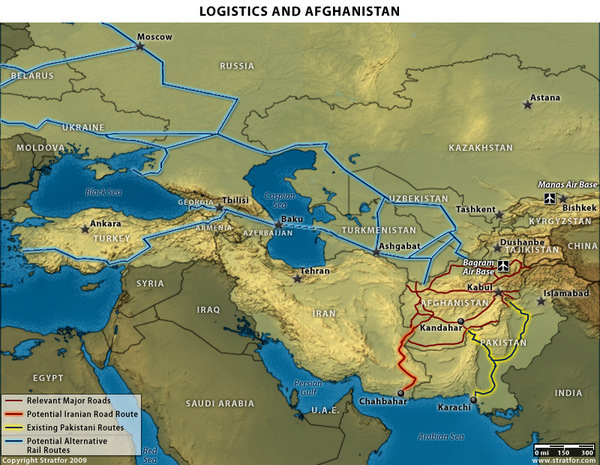 In the meantime, four years after expelling the U.S. from the airbase in Kharshi-Khanabad, the Uzbek regime is welcoming the possibility of assisting the United States and NATO's non-military cargo transportation through its territory. According to the latest reports, Washington will also start actively using Uzbekistan's Navoi airport reconstructed by South Korea. Although the talks about reactivating the relationship between Tashkent and Washington has been in the news for months, Uzbekistan's President Islam Karimov announcement on May 11 about the readiness of Navoi airport for the transportation of U.S. cargo fuelled discussion within the Kyrgyz media. As one Kyrgyz expert commented to Jamestown, Bakiyev might find his position vis-à-vis cooperation with the United States weakened. According to Jamestown sources, the Kyrgyz regime when announcing the expulsion of the U.S. from the base in February hoped to receive a lucrative counter-offer from Washington. On May 12, the U.S. Senate approved $30 million in helping Manas airport reconstruct its traffic control infrastructure. The announcement comes as a further indication that the U.S. military might secure continued access to Manas. Skeptics in Kyrgyzstan believe that the additional funds will serve to persuade the regime to continue supporting Washington's engagement in Afghanistan. U.S. military and humanitarian assistance to Kyrgyzstan has also increased this year. According to international reports, the money will not be made available should the base close (Reuters, May 12). It is important to note, that control over Manas airport is concentrated within the hands of owners with very close ties to the ruling regime. Kyrgyz opposition leaders share Tekebayev's fears that should the U.S. base remain the county's human rights and democratization records are likely to worsen. Of particular concern are the upcoming presidential elections, which many in Kyrgyzstan expect to be falsified. During the past four years since coming to power, Bakiyev has created a government and parliament loyal to his regime. Dozens of politicians and journalists were suspiciously killed during his tenure. The opposition hopes that the international community will pressure the president to carry out reforms in his bid for re-election. Earlier the Kyrgyz Prime Minister Igor Chudinov mentioned the possibility of converting the Manas base into a civilian transit hub to be used for U.S. and NATO cargo (www.akipress.kg, May 13). Potentially, the Manas and Navoi airbases could switch roles with the Navoi base extending to military functions as well. The situation is further complicated between Bishkek and Tashkent with Karimov's stern disapproval of the construction of hydropower stations in Kyrgyzstan. At his meeting with Russian president Dmitry Medvedev in January, Karimov was straightforward about his objections to Kyrgyzstani and Tajikistani plans to build new stations -which he sees as a potential national threat. This did not prevent the Kremlin only day's later promising additional investment into Kyrgyzstan's hydropower sector. Kyrgyz leaders insist that the Bakiyev's decision to expel the Manas airbase is final and that the Russian credit will be used for the construction of strategic hydropower stations. The Russian government and media have largely ignored the latest developments. Only individual newspapers commented about the implications of a new twist in U.S. relations with Kyrgyzstan and Uzbekistan. It appears that in the run up to the election the Bakiyev regime has been able to achieve Russia's financial support as well as additional U.S. investment into Manas. By collecting the carrots, Bakiyev may have cunningly escaped the sticks. Whether he can successfully continue straddling two chairs will become clearer after the elections.